Lorcan, Prince of the Leprechauns, has been under an ugly spell for centuries. A unique event takes place each year on the spring equinox, in the small sleepy town of Glen Kisswish Village, perched on the edge of the Atlantic Ocean. Prince Lorcan chooses a village girl to kiss. Her cooperation brings prosperity and wellbeing to the village. This year Aine Byrne is the lucky one – not! Aine freaks out at the thought of kissing Lorcan. She’d rather kiss a toad. Besides, she has a crush on another guy. What’s a girl to do? Her village is counting on her as she secretly tries to find a way out of The Kiss. Only Lorcan’s soul mate can break the curse with her kiss. What are the chances he’ll find his true love when she must have a blend of human, fairy and mermaid blood pulsing in her veins? Added to his problems is the fact that someone wants to make sure he doesn’t find his soul mate. When Aine disappears into thin air shortly before the equinox, Prince Lorcan calls in all favors, and even agrees to the help of the famous and powerful fairy wizard Menw. Perhaps Aine’s magical Irish Wolfhound, Shags, can sniff her out. This story is an adventure filled with fantasy, shapeshifting, witches, wizards and all sorts of magic. It carries the subtle message that true beauty is not skin deep, and we should pursue our goals no matter how hard the obstacles appear to be. 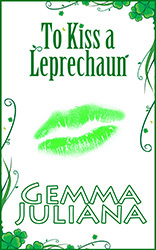 To Kiss A Leprechaun is a fine read for St. Patrick’s Day, or any day, and will bring joy to all people who hold Ireland in a special place in their hearts. When one thinks of Ireland and the month of March, one thinks of St. Patrick’s day. Ireland is so much more than this. Ireland is a land steeped in some of the greatest magical quests and stories the world has ever known. Gods, Goddesses, magicians, druids, wizards, fairies and all forms of the supernatural Otherworld are everyday fodder for creative minds. Ireland is a land of mystery and magic… where the land is alive and worlds upon worlds await your adventures… where one can easily shift from this world to another time and place. Enjoy the magic.